Stephen Scott-Hoy is an optometrist who is passionate about his work! Prior to moving to Tasmania he ran the Eyebus in country South Australia for over 20 years. He also visited Vanuatu for nearly ten years to run primary eyeclinics in conjunction with the Vanuatu Christian Council. He has many stories to tell. These days when not working, he can be seen regularly riding his bike with the Port Sorell Legends or paddling his kayak at Hawley! Karen Scott-Hoy can't stand ill-fitting glasses! 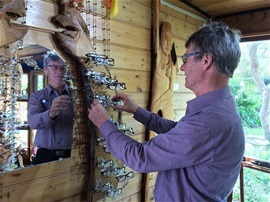 Having worked with Stephen in the Eyebus in country South Australia she is a whizz at tweaking, repairing and helping people have fun choosing the best glasses they ever had! 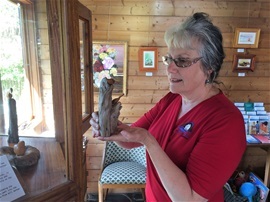 When not working with Stephen she can be found carving beautiful sculptures from Huon Pine, painting or supporting the arts through Rubicon River Arts or leading Laughter groups!